January 24, 2019 – Every industry has events of paramount importance. Cineastes will tell you that certain movies shown in Cannes were “unrivaled”. Those movies do not directly compete with others. 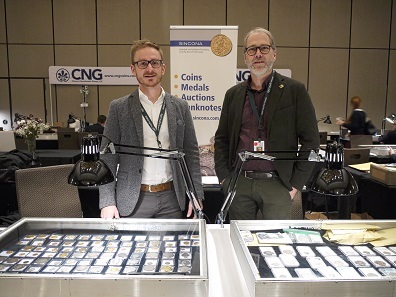 The same could be said about the New York International Numismatic Convention (NYINC). In 2019, it took place for the 47th time already – which is a testimony to its success in itself. Anyone who’s interested in classical numismatics and world coins absolutely must attend this convention. Hence, you will meet representatives of almost all major auction houses and numerous dealers from the United States and the rest of the world in New York. The great “Ballroom” at the Grand Hyatt in Manhattan buzzed with excitement before the convention began. Photo: Björn Schöpe. Kevin Foley commemorated two colleagues and friends who passed away recently: Christian Blom and Richard Margolis, one of the founders of the NYINC. Photo: Björn Schöpe. 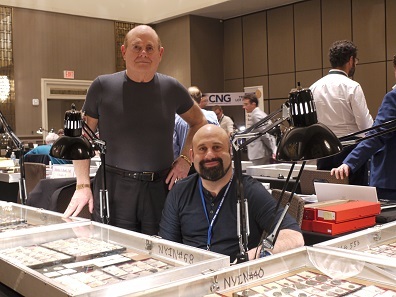 If we talk about the history of the NYINC, we do have to honor Richard Margolis, one of the founders of the numismatic mega event, who passed away last year. (This link will take you to an obituary.) 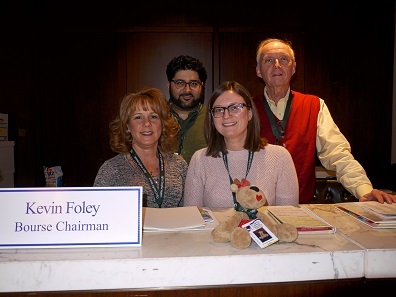 Kevin Foley, the convention organizer, paid tribute to his friend by dedicating a table to him. 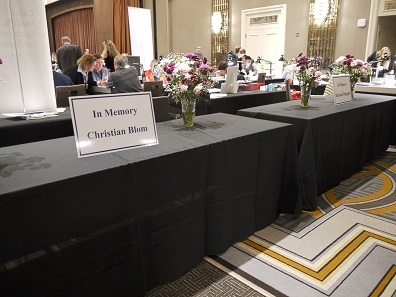 And right beside it, a second table was set up commemorating the late Christian Blom. 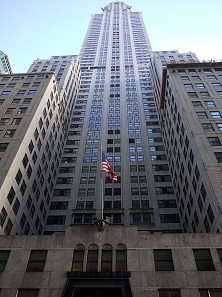 The Chrysler Building is located right next to the Grand Hyatt where the NYINC takes place. It doesn’t get more central than that! Photo: Björn Schöpe. This is fairly remarkable seeing as the tables at the NYINC are worth a fortune. Spots are highly coveted and the waiting lists are long. Anyone who scores a table will surely reserve it for the following year as well. The venue can be reached easily. The convention has taken place at the Grand Hyatt, right next to Grand Central Station at the heart of Manhattan since last year! 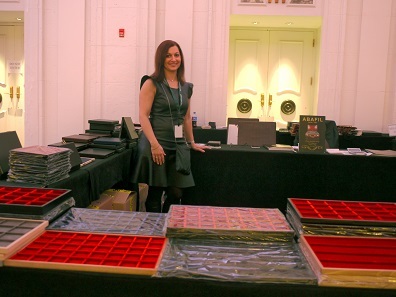 The lobby was home to registration tables, a book booth, and an abundance of boxes and other exclusive safe-keeping and storage accessories offered by the Italian company Abafil. It was also the way to get to the auction halls – and it was were you could get some of the popular drinking water! You encountered familiar faces in front of the elevators anyway. Don’t be fooled by this picture. It was only this calm in the early hours of the morning. Photo: Björn Schöpe. The actual convention took place for four days, from January 10th to January 13th, 2019. 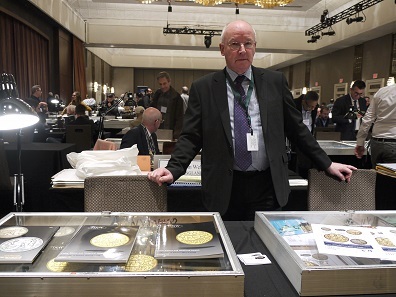 However, numerous important auction houses already held auctions full of rarities, gems, and exquisite collections from January 4th on: Baldwin’s of St James’s, Heritage, Spink, Classical Numismatic Group, The New York Sale (a joint auction of Ira and Larry Goldberg, M&M Numismatics, Sovereign Rarities and Dmitry Markov), and Stack’s Bowers Ponterio. 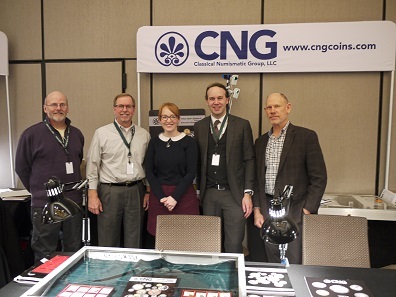 The CNG booth was busy all the time, so it wasn’t easy to get the whole team together for a picture. From left to right: Kerry Wetterstrom, Michael Gasvoda, Caroline Holmes, Paul Hill and David Michaels. Photo: Björn Schöpe. Steve Pruzinsky diligently attended to everyone at CNG’s Lot Pick-up of the Triton Auction. Photo: Björn Schöpe. You could find Steve Pruzinsky at the Pick-up table of the Triton Auction from dawn till dusk – usually he was surrounded by numerous customers. The “Early Birds” stormed the room at 12pm sharp on Thursday. The professional, yet friendly security guards were omnipresent at the entrance and the entire floor (one of them is seen on the right). Photo: Björn Schöpe. 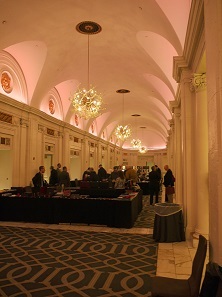 More than 100 dealers and auction houses were waiting in the enormous and beautiful Ballroom of the Grand Hyatt when the doors opened at 12pm on Thursday and the Early Birds entered the convention. The determined professionals paid six times the price of a regular ticket to be able to search for treasures before the actual opening – and they did so with abandon! 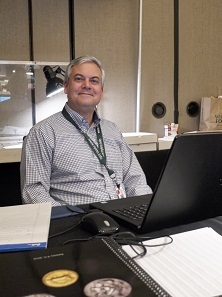 Kevin Foley and his organization team continues to do an amazing job and has ensured general satisfaction for years – and that’s saying something if you consider the logistical challenges of this event! From left to right: Rhonda Burger, Omar Mallick, Patricia Foley, Kevin Foley. The mascot Rhonda Reindeer in the foreground. Photo: Björn Schöpe. 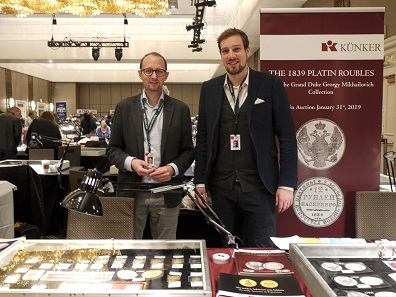 The only downer about the whole thing was that, once again, the NYINC and the FUN ( = Florida United Numismatists) Show, the second large convention in the United States in January, took place at the same time. This has caused widespread dissatisfaction in the past already because both events are important. The good news is that in the next few years, the conventions are timed so that visiting both will once again be possible! 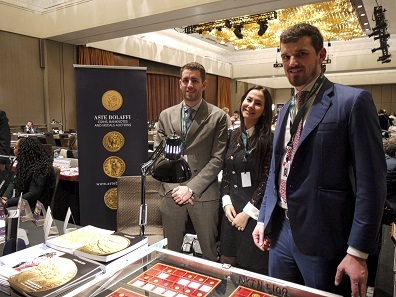 In 2020, numismatists from all over the world will once again make sure to attend the NYINC – it truly is an event you shouldn’t miss. 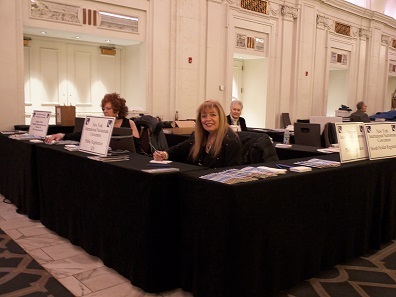 The friendly and helpful registration team provided every visitor with name tags – which is fairly unusual for Europeans, but extremely helpful in one-on-one conversations. Photo: Björn Schöpe. Auction house Künker was one of the few representatives from Germany. Seen here: Ulrich Künker and Fabian Halbich. Photo: Björn Schöpe. Representatives of Sincona travelled all the way from Switzerland to NYC: Michael Hardmeier and Arne Kirsch. Photo: Björn Schöpe. Several Italian dealers set out for New York as well, e.g. the Turin-based auction house Aste Bolaffi. Photo: Björn Schöpe. A charming person to approach for anyone who is looking to appropriately store and present their favorite pieces: Annalisa Garretto of Abafil. Photo: Björn Schöpe. Peter Preston-Morley represented the UK-based auction house Dix Noonan Webb. Photo: Björn Schöpe. 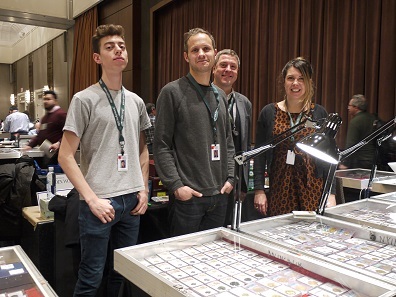 The young team of Atlas Numismatics is always in a good mood: Rexford Goldbaum, James Ricks, Christopher Baker and Kira Eisenach. Photo: Björn Schöpe. 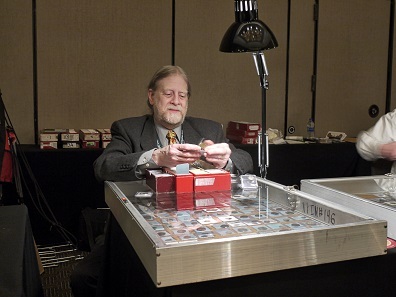 Renowned and esteemed: coin dealer Allen G. Berman, better known as Alanus I – part-time King of Bermania. Photo: Björn Schöpe. 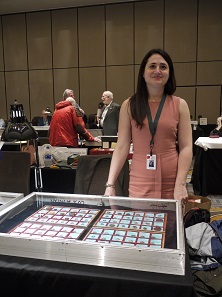 Shanna Schmidt set up her own business as a coin dealer in 2016 after having worked for her family’s business Harlan J. Berk for a long time. Of course, she also attends the NYINC every year. Photo: Björn Schöpe. Continuity for generations: Harlan J. Berk and his son Aaron. Photo: Björn Schöpe. This link takes you to the official NYINC website. The NYINC will take place from January 16th to January 19th next year. Even though tables are difficult to get, it doesn’t hurt to reach out to Kevin Foley about it. There is a waiting list! If you aren’t familiar with the jovial Kingdom of Bermania yet, this website will tell you more about it.